So this year Christmas decorating in our house was a bit challenging. Not only do we have a small infant in the house that requires most of my time during the day but we are seriously lacking square footage since Emma came to town. If you are not familiar with the layout of our house, its a 2-story with the living room, kitchen & breakfast area downstairs & all the bedrooms are up. In years past we have put the Christmas tree downstairs by our front door but now our living room is full. We added a reclining rocker before Emma was born + we have our pack n play & swing downstairs which filled up the space. Chris really tried to talk me into not putting up a tree this year but to me that wasn't an option with this being Emma's first Christmas (I know it will not be very exciting for her but she loves the lights). So I opted to put the tree in our breakfast area. 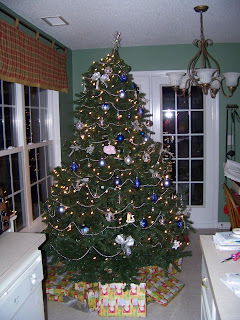 I must admit it looks a bit odd there but the tree is very pretty decorated in blue & silver (the same as last year). I may post a picture or two so you see just how odd but pretty it looks. Hopefully next year will have better options. I know it was trouble, but I bet you are glad to have the tree up anyway. It makes you feel like you are still part of the rest of the world!